Very soft and plush. True to picture. 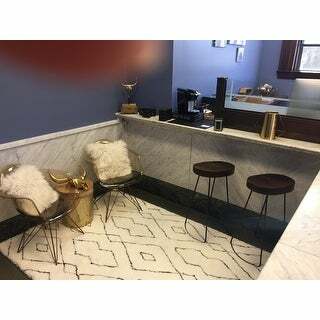 Beautiful rug, have gotten compliments. We use in a high traffic area of our home- so far so good! 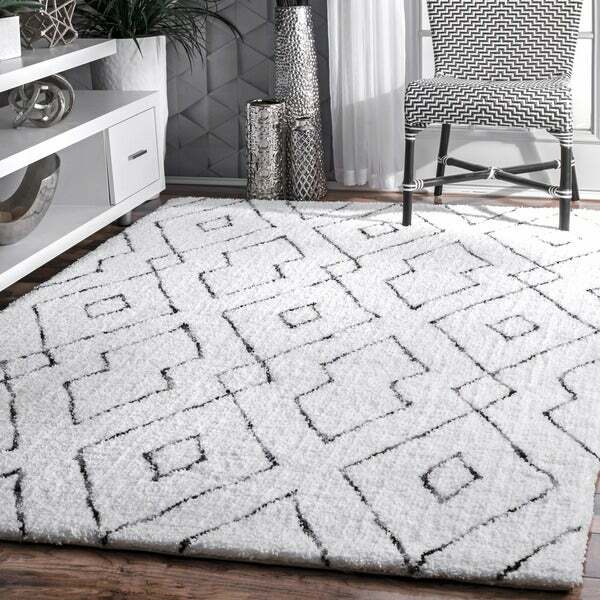 Hand tufted from 100-percent polyester, this plush area rug offers durable style. The shaggy white backdrop is patterned with a trendy black geometric design to complement your contemporary decor. Perfectly fit your space by choosing from 13 versatile sizes. Dimensions 60.0 In. X 7.0 In. X 7.0 In. Option: 7' 6" x 9' 6"
I tried to buy a few different area rugs from other websites but none of them would ship to Alaska. Worked out in my favor because I love this rug! Very plush! We keep it in a high traffic area and it seems to be holding up pretty well. Due to being white it does show some dinginess in the higher traffic areas but it cleans up nice with a little TLC every once in a while. I was so surprised at how SOFT this rug actually was when it arrived! It is so incredibly soft! My toddler wanted to lay on it and kept saying it was so cozy! Which is perfect because I bought it for a nursery and i know we will be spending time on the floor so it’s so nice to have a plush and soft rug that doesn’t shed. The pattern and coloring is exactly how it appears in the photos which I was thankful for and it goes perfectly with the other decor I’ve selected. I highly recommend this rug if you want something uber soft and cozy. It does have a slight smell to it but I’m letting it air out and flatten and from past experience, I’m confident it will be gone before we know it. But I really can’t get over how soft this is! I’m super happy with my purchase! this is an excellent rug for the price. Ice white and good for a low traffic area. Its obviously a synthetic but very plush. I had to return because the size didnt work for my space . easy return and replaced with a similar. 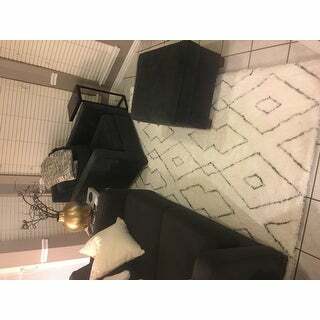 This rug is so cool looking because of the pattern and its a really great shag rug. Its super plush without looking like a shag rug (this is coming from someone who hates most shag rugs!). Would recommend and buy again! I received two of these for my photography studio. Opened them up and put them in the space. I've tried everything to get them to smell better short of shampooing them. I've moved them twice to let them air out and it still hasn't helped. Not thrilled with spending more to make something new smell better. 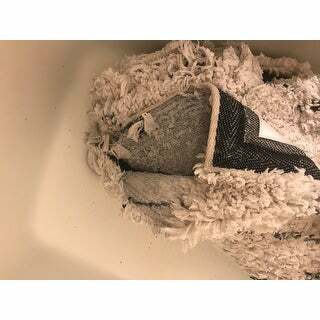 They are soft and great quality but smelling like skunk is a deal breaker. I had low expectations for this rug and was expecting I'd return it for the similar style from West Elm. Pleasantly surprised! The pattern is great and it's very very soft underfoot. There are some imperfections in color quality of the yarn, but they are negligible at best. Great rug for the price. This item is not as described. The grey diamond lattice is actually navy blue. I ordered a replacement after the first rug arrived for this reason thinking they sent the wrong rug but the second one also was made of navy blue fibers. After reading the reviews, I was very concerned about the smell. But it seemed to be a perfect match to my black leather couch, so I went for it. I placed it in my home office which has four windows on two sides of the wall and was able to get rid of the chemical smell pretty well after leaving the windows open for two days. I am very happy with the carpet! I'm so disappointed with this rug! I was so excited when we first received it. It's the softest rug I have ever felt. After a few months of living with it, the black has rubbed off onto the white and it looks gray and the pile now looks terrible! Huge disappointment. I'm now going to have to spend more money on a new rug when I should have just spent more to begin with on a good rug. The look and feel of the rug is fabulous (especially for the price) - it's plush, thick, attractive, and so soft. Vaccums easily with minimal shedding. I had to remove it from the house due to the overwhelming smell of rubber / chemicals - that can't be good to live with. Really wish this was not a problem, otherwise would have given it a much higher rating. This is a great rug for a great price! Vacuums well and my family raves about how soft it is. There was a slight odor for about 30 minutes after I opened it, but it was gone quickly. You can't go wrong with this one. Very soft. It definitely gets dirty fast but that's normal for a white rug. Super plush, soft, and beautiful. It’s very soft to walk on and looks beautiful in my bedroom! Fits perfectly under my full sized bed how I wanted and is a nice feel for my feet in the morning as opposed to the hardwood I was used to. It shipped very securely and I have no complaints! very soft and so far seems durable! This rug is absolutely stunning...unfortunately it didn't work with our home and pets but it is beautiful! Beautiful! A conversation piece, all on it's own. All the rave! Beautiful rug! Hard to clean because of the shag, but that’s a given. Would purchase again! The size was perfect for our room and it was excellent quality, and fast shipping! Love the rug works great in my office. "How do you clean this rug? Mine looks so gross and I don’t know the best way to go about making it white again"
It will be close to impossible to get it back to its original white color but you can follow the following instructions Instructions for best results: mix a small amount of clear, mild detergent with water. Use this to clean the entire rug surface and rinse with a garden hose. Allow both sides of the rug time to fully dry outdoors, in direct sunlight. "Is this rug easy to clean? What ways have you found are the most effective in cleaning it?" Polyester is a strong fiber that is resistant to mildew and staining. Polyester fibers are quick drying. This rug therefore is quite easy to clean for a shag. When first removed from its packaging, shag rugs may have a flattened or matted appearance. Simply fluff the surface by hand in order to remedy this. Due to the higher pile in comparison to other rug types, a high amount of shedding is normal and expected. This is especially true for Wool Shag items. Prior to vacuuming, turn the rug face down and gently shake it out to dislodge any dirt that may have gotten trapped deep within the fibers. Using a suction only attachment, vacuum in between individual rows on your rug. "What color is the other color besides white?" It is black and gray. "Where can you buy the framed art in this picture?" We do not offer this artwork on our website at this time. "Is the background a bright white or ivory?" "What color is the diamond detail?" The diamond detail is Dark Grey.